Designs by Lisa Somerville: Bloggers Challenge - Alter It! Bloggers Challenge - Alter It! Another Friday, another Bloggers Challenge! This week I assigned the theme Alter It to the Bloggers Challenge Players, it's always fun to see what they come up with to alter. If you're like me, you've probably got a ton of things in your alterable cabinet - drag them out and play along with us this week. I decided to alter these great Gift Boxes that my friend Robin sent to me. Here's the pieces I had to work with. I decided to cover the "not so pretty" red box with some pretty Bella Rose papers. I measured my box, then cut my DSP and adhered in place. Lucky for me, SU's Jumbo Eyelet popped right into the eyelets in place. For the inside, I covered the cardboard with Parisian Breeze DSP. 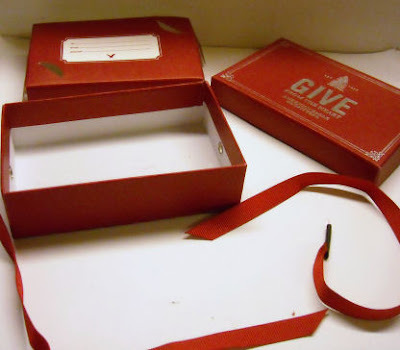 The box would be perfect for a gift card, or a piece of jewelry. 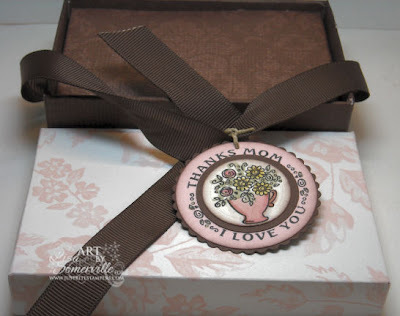 For my sentiment I used the JustRite Favorite Occasions Set - this set has interchangeable centers and borders, and is perfect for tags! I stamped in Black on Watercolor paper, cut with my Nesties Circle, then colored using the Marker Watercoloring Technique. Sponged the edges, then added some Spica Glitter to the flowers. This circle is layered on a Chocolate 1-3/8" circle. 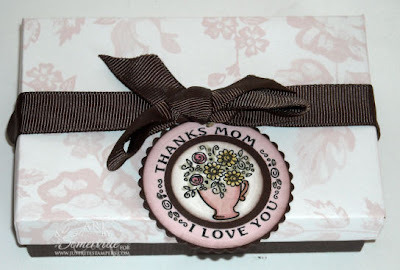 The sentiment is stamped in black on Pink then cut with the Circle Nesties, layered on a Chocolate Nesties Scallop. I punched a small hole, threaded through some Hemp and tied it on to the Chocolate Grosgrain. Be sure to click on the Bloggers Challenge link on my sidebar to see what the other players created this week. Lisa such a beautiful box...it will make an awesome give...I really like that stamp. Very pretty Lisa! You guys make me not want to throw out ANYTHING!! ha ha! Beautiful Lisa! I have all kinds of boxes waiting to be altered...lol...one day! Niceeeeeeeee! What a beauty the beast turned out to be! I was hoping you'd do one of those boxes! It turned out beautifully - but I knew it would! Fantastic job! I LOVE the colors that you chose to go with it! Wow, Lisa, these turned out SO nice! Love that tag stamp too! 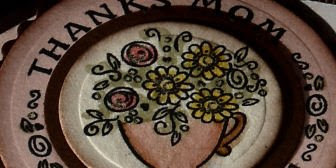 These will be a gorgeous presentation for gifts! What a beautiful box (after you altered it!!). And what a great tag you added!! Great project! 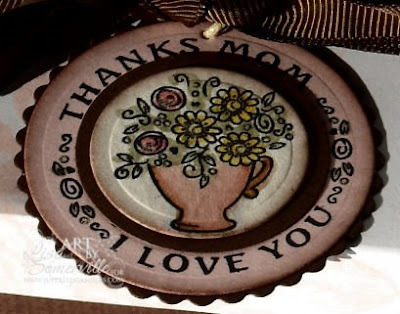 I love the tag--so sweet! ooooooh! What a beautiful box! Love that paper! Wonderful project...I bet Mom Loves it!!!! Your mom will love this. It's perfect in every way!! Turned otu wonderful! Great job! Ah, the gift boxes return! Great seeing what you have done with them Lisa. This is beautiful, Lisa! What a change the pretty paper made! Ohh, love this. Great color choices fun project. Beautifully done. Super Pretty. What a great make-over these boxes received. They are just lovely. This box turned out gorgeous!!! Great idea!